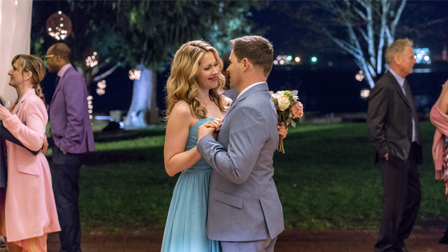 Its a Wonderful Movie - Your Guide to Family and Christmas Movies on TV: Here Comes "The Perfect Bride" -- a Hallmark Channel Original "June Wedding" Movie Starring Two "When Calls the Heart" favorites - Pascale Hutton & Kavan Smith!! 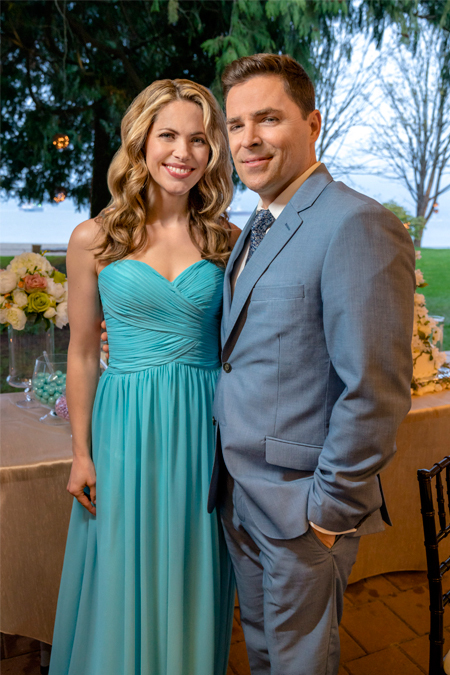 Here Comes "The Perfect Bride" -- a Hallmark Channel Original "June Wedding" Movie Starring Two "When Calls the Heart" favorites - Pascale Hutton & Kavan Smith!! *Part of Hallmark's June Weddings! 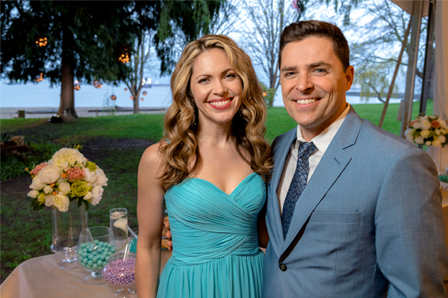 *Yes, it's Pascale Hutton (Rosemary) and Kavan Smith (Lee) from Hallmark Channel's weekly drama series "When Calls the Heart"! Storyline via Hallmark: Fitness trainer/former marriage counselor Molly White (Pascale Hutton) runs Bridal Boot Camp classes combining fitness and yoga with pre-marital counseling exercises to brides and grooms before their big day. While struggling with marital issues from her past, Molly meets the handsome Nick Dyson (Kavan Smith), a talented photographer who seems to be having doubts about his upcoming marriage to Molly’s client, an overbearing perfectionist. While helping couples find their happiness and begin their new lives together, Molly discovers she, too, needs to learn how to forgive herself from her past so she can move forward with life – and love – in her future. 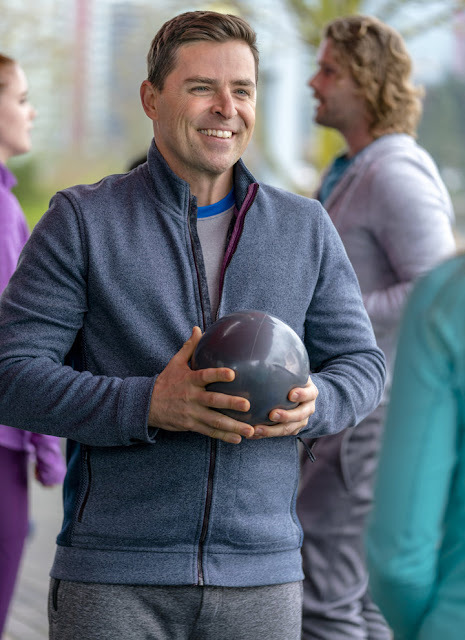 I did enjoy Kavan Smith in Wedding Bells and he was good as second lead in The Irresisible Blueberry Farm but personally I just don't think he really shines as a Hallmark hero. I do love him in the good roles, but when I saw him in the Garage Sale Mysteries as the bad guy (I cant remember which one it was) he was soooo gooood as the bad guy. I want to see him in more of those roles. Seriously? Anonymous? I think Kavan Smith is great in every role he takes on. It's like high school, you have your good looking popular sports jock or there's the cute guy in computer class or drama club. That's Kavan, in my opinion. He may not be the 6 foot mold for leading man, but I think it's safe to say he stole just as many hearts, including mine!!!!!! Sabrina, I thought Kavan was good in GSM too! It was, by the way, Garage Sale Mystery: All That Glitters! This should be good. I enjoy both actors. Love these two so much! 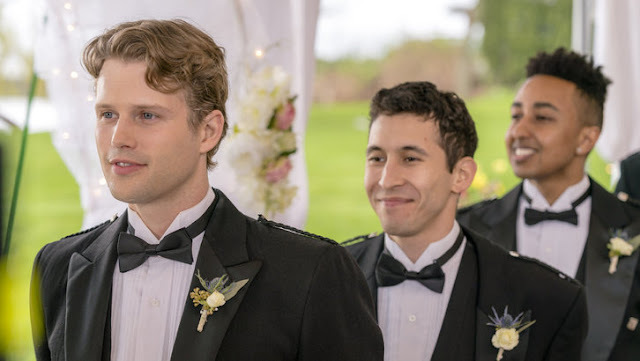 Hope we see them as leads in more Hallmark movies! If possible, I would love to see Pascale in her own Christmas movie! Would anyone happen to know the location where the wedding was filmed? I really enjoyed this movie tonight. I love both of these characters alot. Being a trainer myself it really encouraged and inspired me so much. I would like to know the song played toward the beginning when she is looking at her wedding dress hanging in the closet, then tries it on. I've been trying to find it too....no luck. I have been trying this song too....but no luck. While watching the movie with my captioning on, it says the song is called "Never Far", by Hayley Sales. The interesting thing is, Haley Sales is a singer-- and actress... in this movie. She is the first bride shown (having the quarrel with her soon to be hubby). Thank you, Anonymous! I thought closed captioning might work- so glad it did! That is such a beautiful clip of the song! My sister (who has an incredible eye, and ear, for detail!) 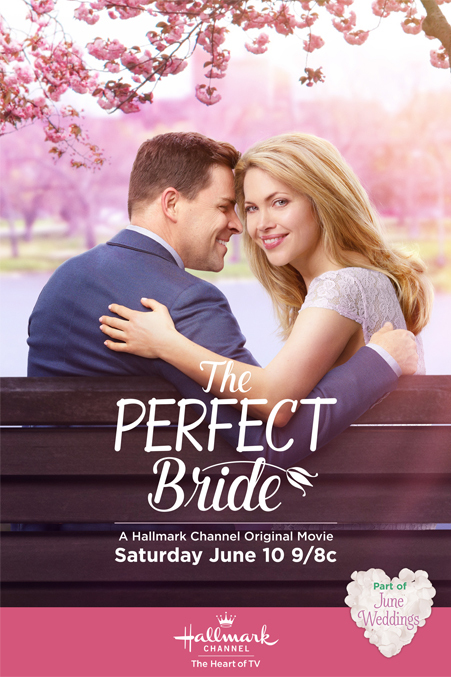 mentioned to me yesterday that it might be Hayley Sales (the first bride in the movie) singing that and I recalled Hayley mentioning on Twitter : "Ps...one of my songs is in the soundtrack #theperfectbride 😉"
It was a okay movie!! who is the bride's mother? Not my cup of tea. Just an ok movie. Though I like them both in WCTH. WATCHED THIS AGAIN TONIGHT AND LOVED IT AS MUCH AS I DID THE FIRST TIME. THESE TWO ARE THE BEST TOGETHER. I'M SO GLAD LEE AND ROSEMARY WILL BE BACK FOR MORE WCTH AT CHRISTMAS! 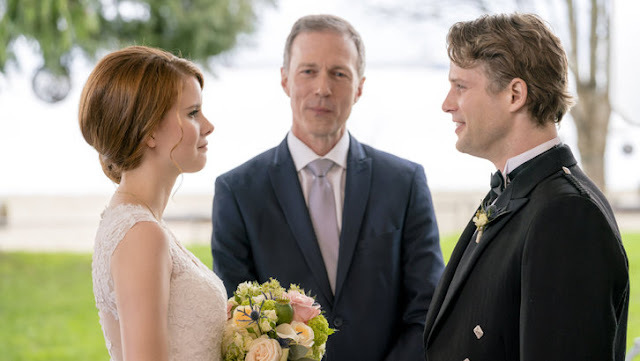 I'd like to know the song and singer of a lot of these Hallmark movies that you can't find anywhere and no one will answer your question if you ask. I've e-mailed Hallmark directly about various including this (Never That Far Away) I think is the name and never get a response. In case you didn't see the information above, the song is "Never Far" by Hayley Sales, the first bride in the movie! She has several tracks listed on Amazon. Hopefully this one will be added there soon! It was not bad. It was quite enjoyable to watch, but not super awesome and not sure I would want to watch it again. 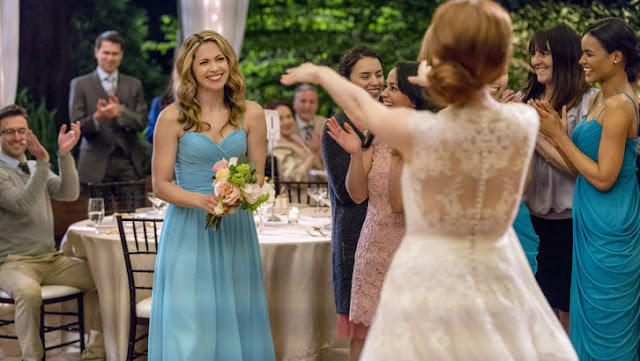 However, I just love Pascale Hutton in this! She was so cute and such a great actress! Would love to see her again in another movies! LOVED this movie! It was along the lines of "The Wedding Planner" but had a fresh take on it. 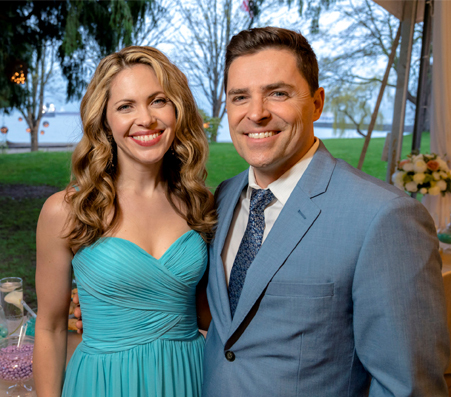 Absolutely love Kavan Smith and Pascale Hutton! They both shined in this movie! And together? Their humor and warmth as a couple adds a great dimension to their wonderful chemistry! This movie really showed their love developing and it was great to see many characters overcome things while learning to forgive and move on. This movie was like a mini life and marriage counseling session; great advice! Really liked this movie! Thank you Hallmark! I love the dress Hayley Sales wore in the kitchen scene before she gets married and wondered who is the designer? I looked all over the Hallmark website and can't find it. I'd like to know where this was filmed. Hope this information is helpful to you! It is such a sweet movie, and all the film shots, especially outdoors, are quite beautiful! 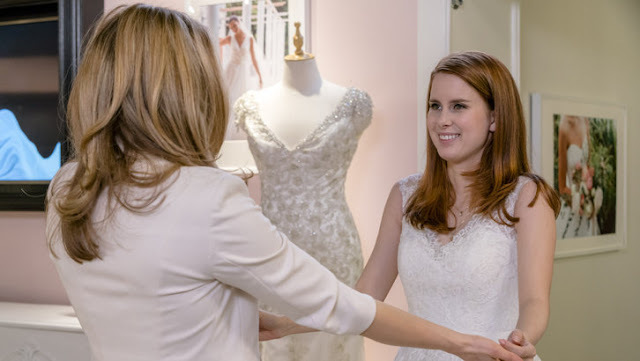 I've been mostly underimpressed with the latest movies from hallmark (most of them from the last year or so), so I was very excited that this one was great. I really enjoyed it. 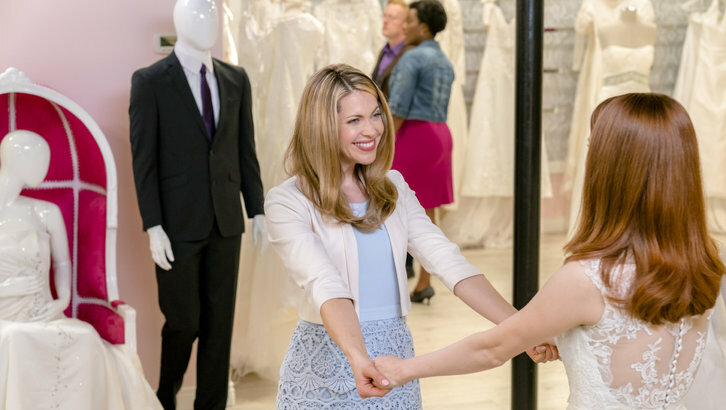 It's a keeper on my dvr for sure and I loved seeing Pascale Hutton play a slightly different role from her flighty, bubbly WCTH character. Does anyone know you sings the song they dance to at the wedding "Can't keep my eyes off of you"? Hello Sandy! Yes, I can help you with that song from "The Perfect Bride." The song they dance to is "You And Me" by Lifehouse. You can listen to it or download it on Amazon - *click here*. It's such a great song! Hope that helps! I love this song in the movie - fits perfectly! And, I love that they brought it back for the sequel!